Several people have already blogged about Google’s AROUND proximity operator: Digital Inspiration, ResearchBuzz, SearchReSearch and Phil Bradley to name just four. According to SearchReSearch the command has been available for 5-6 years, which begs the question “Why has no-one picked up on it before now?” Could it possibly be because the operator does not do what it says on the tin? Perish the thought and wash my brain out with soap and water for even considering such a thing. The AROUND command allows you to specify the maximum number of words that separate your search terms. The syntax is firstword AROUND(n) secondword. For example oil AROUND(2) production. The results are relevant and as usual Google appears to be listing first those pages where the terms appear next to one another. If we did want to be more precise and reduce the number we could search for the phrase: "macular degeneration". Not surprisingly the number of results has been reduced significantly to 1,690,000. Let us now say that my enquirer has come back with an amendment to the original request. They have been told that there are several forms of macular degeneration, for example macular disciform degeneration, and they want a selection of articles covering as many of them as possible. I have a biomedical background and can easily identify the relevant phrases and run separate searches on them, but what if I didn’t have a clue where to start? I could use Google’s asterisk (*) between my two terms to stand in for one or more words. The strategy macular * degeneration gives us a massive 21,500,000 results, far more than our first basic search if the numbers are to be believed. In just the first 6 results we have picked up vitelliform and disciform degeneration, and more are picked up in the subsequent 20-30 results. Google’s search tips say “If you include * within a query, it tells Google to try to treat the star as a placeholder for any unknown term(s) and then find the best matches.” It is not clear from this whether the asterisk stands in for one or more terms. Adding more asterisks to the search does not alter the number of results, which in any case are only an estimate. We do, though, see very different content and now variations on our terms (for example macula) are appearing emboldened in the page summaries. We could try and force an exact match search by placing a plus sign before macular in our strategy, but let’s try and keep this exercise simple. Now for three searches using AROUND(n). Note that AROUND must be in capital letters, otherwise Google will treat it as just another search term. Specifying the number of separating words as 1, 2 and 3 gave me 1,710,000, 1,710,000 and 1,720,000 results respectively. The results are very different from the searches incorporating the asterisk and AROUND(2) and AROUND(3) were identical. Also, it seems that with the AROUND operator Google is giving priority to documents where the terms are a phrase and not separated by any other words. It was only when I reached around 650 that I started to see phrases where my two terms were separated by one other word. Using just AROUND without any number gave me 1,610,000 results that looked very similar to those obtained with AROUND(1). Logically, one might think that macular AROUND(0) degeneration would be the same as a search on the phrase "macular degeneration". It isn’t! Not only are the number of results different (AROUND(0) comes back with 4, 250,000 compared with 1,690,000 from the phrase search) but so is the content. Finally, I decided to follow Phil Bradley’s lead and see what happens when I try and exclude the phrase from the AROUND(0) search: macular AROUND(0) degeneration -"macular degeneration". I got 43,000 results in which the terms seemed to appear anywhere within the document, in any order and separated by any number of other words. In conclusion, despite what I said earlier I think AROUND does work but it is difficult to test because Google always seems to give priority to pages in which your terms appear as a phrase and not separated by any other words. Its effect is probably more obvious if you are dealing with a topic that would otherwise return a very small number of results. The ranking and sorting of the results changes significantly, though, when you use AROUND so it might be worth trying if you are fed up with seeing the same documents and sites again and again. In all of the test searches I have carried out so far I still prefer the asterisk, especially if I want to be able to identify expanded phrases quickly and easily. But, as the saying goes, your mileage may vary. Feedback on your own experiences, please. LinkedIn has added a new feature called InMap that enables you to visualise your LinkedIn connections, how they are connected and to identify gaps in your network. Go to http://inmaps.linkedinlabs.com/, log in with your LinkedIn user name and password and it should then create a map showing the connections between the people in your LinkedIn Network. I’m afraid I failed at the first hurdle: my profile was only 50% complete and it has to be 75% before a map can be generated. A slap on the wrists for me then and a crafty way to make you give LinkedIn more data about yourself. (Yes, I know I’m a cynic). The result was interesting but confusing and, frankly, a bit of a mess. I’ve seen some other people’s maps – there are options to share them on Twitter, Facebook and LinkedIn – and one resembled a beautiful butterfly. Mine looks like an exploding brain; perhaps LinkedIn is trying to tell me something. The colours are supposed to represent groups of people connected in some way, for example people you have worked with at a particular company or met at conferences. To reveal the name of the person represented by the dot simply move your cursor over it. You can also see all of the names on your map at once by increasing the size, either by clicking on the plus symbol in the upper left hand corner or using the scroll wheel on your mouse. Once you have identified the common factor you can add a label to the colour in the legend in the lower left hand area of the map. And this is where I came unstuck a second time. The only group I could definitely identify as having a common feature was the one containing the purple dots on the right hand side of my map. These were people I had met at executive search and recruitment conferences, but there are also some in this category who were blue, green and orange dots. The problem, I suspect, is that I know many of my network via multiple routes. I think I first met Val Skelton (a green dot) at TFPL but only 3 or 4 other green dots had that connection. Perhaps it was that we often meet up at the Online Information conference and exhibition? No, those contacts where represented by every colour on the map. Or maybe she is one of the Information Today crowd? That theory didn’t work out either. As for the small red dots they are here, there and everywhere and InMap failed to pull then into a neatly contained area on my map.I’m tempted to label them as anarchists! Trying to think more positively about this tool, the map suggests to me that the majority of my network cannot be pigeon-holed. They are unique individuals, each with their own specific set of skills and the ability to move from one sector to another with ease. And I am more than happy with that. Google has added estimated fuel cost to driving directions in its Google Maps.I would never have picked this up had Techradar.com not covered it as we gave up having our own car years ago and Google does not appear to have advertised this feature in the obvious places. If you want to go from A to B and are using Google maps, choose the driving directions as usual and Google gives you the estimated fuel cost at the bottom of the directions. In this case Google tells me that it would cost someone 29 pence to drive from Reading railway station to where I live in Star Road. If you want to see how Google has calculated that then click on the Est. fuel cost link. The default for vehicle type is standard. The other two options are Compact and High Consumption. Fuel type by default is petrol but you can change it to …erm.. just diesel. So no LPG, nor is there any differentiation between unleaded and super unleaded, diesel and premium diesel. Neither is it clear where the price has come from, and if you change the fuel type the fuel price does not change. You can, though, change the price manually. At best the trip from the railway station to my road in a compact car that uses LPG would cost 12 pence. At worst and using a high consumption care with the most expensive fuel the cost would be 55 pence. Of course this is never going to be totally accurate, so it is useful only as a general indication of the likely cost of your journey. As I no longer drive my own car I am not the best person to comment on this aspect. But it does seem to me that you have to fiddle around rather a lot with the settings before Google gives you anything that remotely resembles the true cost. I would be interested in comments from regular drivers on how helpful – or not – this addition to Google Maps is. I wrote the title and description a few months ago before Google really started going to town with messing up search results, so the subtitle “regain control of search” now seems a tad over-optimistic! Readers of this blog and Phil Bradley’s (http://philbradley.typepad.com/phil_bradleys_weblog/) will know what I mean. Just search on Google in both for recent news and comments on what Google is currently up to. Nevertheless, I will be going through the key search features, types of search, and recent developments in Google search – there will probably be even more changes by the end of March – and there will be plenty of time for you to try out ‘stuff’ for yourselves. A reminder that I also run in-house workshops so if you have several members of staff you would like trained, let me know. I can come to you. One of the most frequently asked questions that land in my inbox is “Where can I find information on [insert company name of your choice]”. The enquiry is often about a UK company and comes from ordinary Joe or Josephine Bloggs who knows nothing about sources of business information. Those of you who, like me, have these resources at our fingertips may roll your eyes heavenwards but let’s heave a huge sigh of relief that these people are bothering to ask about checking up on a company. On further investigation, many of my correspondents admit that they have been approached over the phone regarding a “once only opportunity” involving the company concerned and are suspicious of the offer. Unfortunately, I also receive emails from people wanting to find out about a company after they have parted with their money. The first port of call for official information on UK companies is Companies House (http://www.companieshouse.gov.uk/). Not every form of company or organisation is required to register at Companies House: for example, in the UK I am a sole trader and therefore do not have to register or file accounts. I have noticed an increasing number of comments on the web and social media from small businesses who have decided to de-register because of the bureaucracy. The absence of a registration at Companies House is not necessarily cause for concern but then most of us do not cold call people with an “exclusive investment opportunity”! An easy way to check if there is a problem with a company of any sort is to search for them on Google and include scam or hoax in your search. That may seem obvious but so many victims who contact me never considered that strategy. So if you have been approached by the likes of Trotters Independent Traders ltd. plc go to Companies House and use the free Web Check option which is in the centre panel on the home page. You can search for currently or recently dissolved names, dissolved names, previous names or proposed names. Free information includes name, registered number and address, status (for example active, liquidation), nature of business, date of last accounts. Further information and documents such as accounts and certificate of incorporation are priced at GBP 1 each. Several other services re-package and sell information from Companies House and in some cases provide some of the additional priced Companies House information free of charge. Company Check (http://www.companycheck.co.uk/) are part of UK Data (http://ukdata.com/), which re-sells Companies House documents and provides credit reports. The latter include current and historical credit risk information, director details, ownership and group structure, CCJ information and up to five years of accounting figures including turnover and a profit and loss account if filed. All documents cost GBP 18, which is far more than that charged by Companies House but the credit report may be the better option if you need a detailed report and assessment of the company. The Company Check free information includes name, registered address and number, telephone number, activity, status, thumbnail of the web site and cash at bank for the last five years. There is also a graph showing the number of website visitors from Compete (http://www.compete.com/), but this information may not be available for smaller companies. 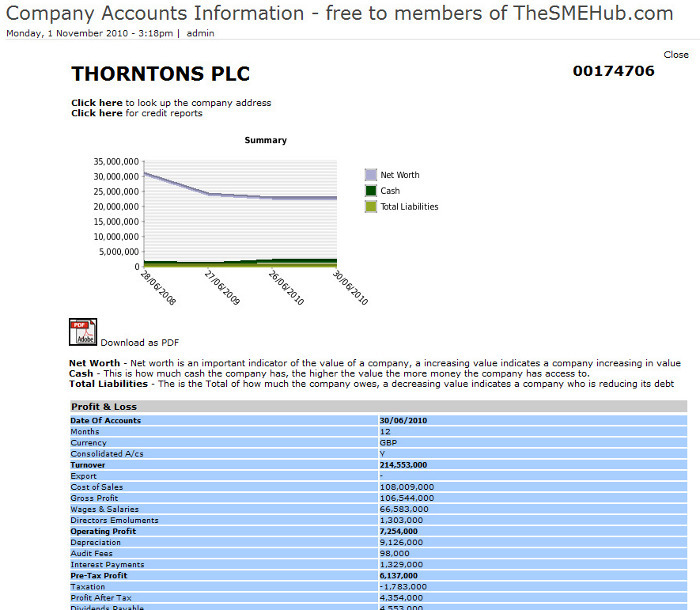 Another source of free company information is the SME Hub Company Accounts Information (http://www.thesmehub.com/benefit/accounts). This is available to SME members only but registration is free. The company address is not displayed but there is a link that takes you to Companies House where you have to re-enter the company name to access the data. There is also a link to Credit Safe for credit reports (http://www.creditsafe.com/). There is a very useful graph showing trends for the company in net worth, cash and total liabilities. The most recent accounts plus a downloadable PDF are also free of charge. I had problems with the SME Hub when looking at companies that had recently gone into liquidation. Company Check gives its standard information plus the status as “Liquidation” but the SME Hub leaves you guessing by presenting you with an empty template. Company Check and the SME Hub are quick and easy ways to access the free and some of the priced Companies House information. 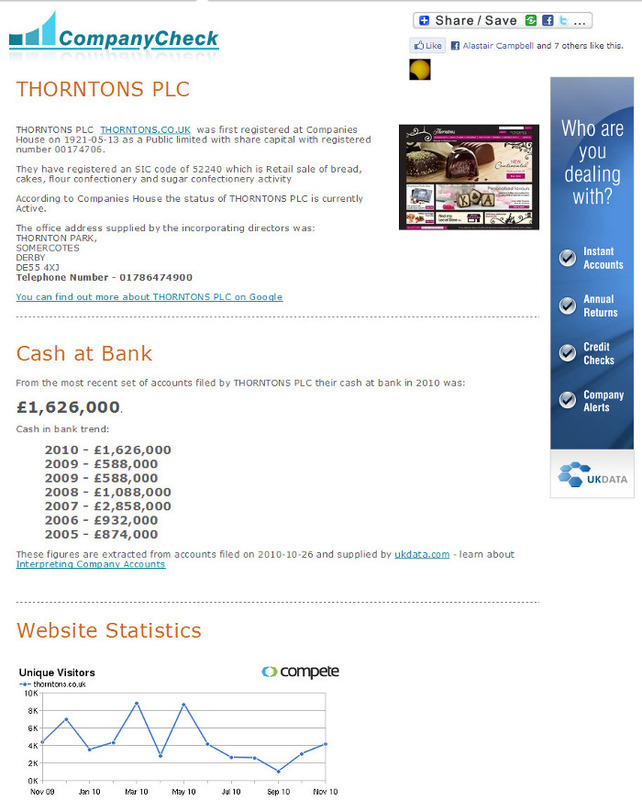 Company Check offers the Companies House free registration data and five years of cash at bank: the SME Hub provides a trends graph of net worth, cash and liabilities plus latest accounts but no basic contact or status information. Both can alert you to potential problems with a company but, ultimately, Companies House is the place to go for the original data. Yes, I am talking to you Google and this time you really have gone too far. All I wanted to do was check up on the background of a photo I had taken of the wall surrounding the graveyard of a church in Reading. The church in question is St Laurence. We have all become accustomed to the “Did you mean…. ?” option at the top of our search results. I found it invaluable early in the morning or late at night when typos were inevitable in my search strategy: yes, thank you, I really did mean ‘widget manufacturers’ and not ‘wigdet manufacturers’. Recently, though, Google has abandoned the optional corrected search and now runs instead the corrected strategy as the default with yours as the extra option. Google has taken this a stage further and runs your search as it thinks fit. On this occasion there were some relevant pages in my results. But yes, Google, I really did want to search for Saint Laurence! Now, it seems, I have to prefix all of my search terms with a plus sign or enclose them in double quote marks to stop Google’s dictatorial behaviour. But why should I have to do that? UPDATE: It has just got worse. I tried a search on the phrase “Saint Laurence” thinking Google would carry out an exact match search, but Google will have no truck with such obvious ploys. (Ignore the Twitter search at the top of the results screen – that is a Greasemonkey script add-on for FireFox).